Raymond Gutierrez on his weight-loss journey: "In order to motivate myself, I want to motivate others." Have you seen Raymond Gutierrez lately? Leaner, lighter, his chubby cheeks gone, he's a changed man, physically and attitude-wise. "You have to change in order to be changed," Raymond wisely said. In a phone interview with PEP.ph (Philippine Entertainment Portal) via What's App on April 21, the TV personality shared he never imagined he could be an inspiration to many. He said, "I'm so overwhelmed and I'm so touched. "Every day, I read messages on my Instagram and direct message saying that I'm their new fitspiration and I'm their new inspiration. "And not in a million years that I've thought na someone would come to me, 'Mond, you're my fitspiration.'" His decision to go fit began with a dare. "That's how this thing came about." And what started for him as a challenge to trim down is now an everyday commitment "because before, I was like the laziest person." And here he is, 65 pounds lighter. By his example, even his sister Ruffa Gutierrez now finds time to work out. On his vlog titled "No More Excuses! Time To Get Fit," Raymond narrated, "I wasn't always fat. Actually, just a few years ago, I was in the best shape of my life. "I was, you know, living with my parents, my family was there, I had the support system. "But when I decided to live on my own, with no help, I was more on 'work, work, work, work' all day, and 'party, party, party' all night. "All these great amazing opportunities fell on my lap, I forgot to take care of my health. "And I had all these excuses in my head that would stop me from working out or eating healthy." The turning point? He related in his vlog feeling "uncomfortable about myself," and that triggered his desire to get back in shape. "I just woke up one day and I hated myself. "I felt so out of shape and unhealthy, and I just told myself, 'I'm sick of being fat.'" In the PEP interview, the 33-year-old TV host further revealed: "I was very unhappy with myself, I didn't feel good about myself, I felt that I can be so much better. "It happened last December that I realized 'I'm coming to a new year, I'm turning a year older in January, and I can do something about it.'" He admitted it didn't happen overnight; it was more, like, "Let's see where we can take this." For starters, instead of the usual late night gimmick for his 33rd birthday party, he threw "the most wholesome party" dubbed as #RideMeMond at a branch of Ride Revolution, an indoor cycling boutique. 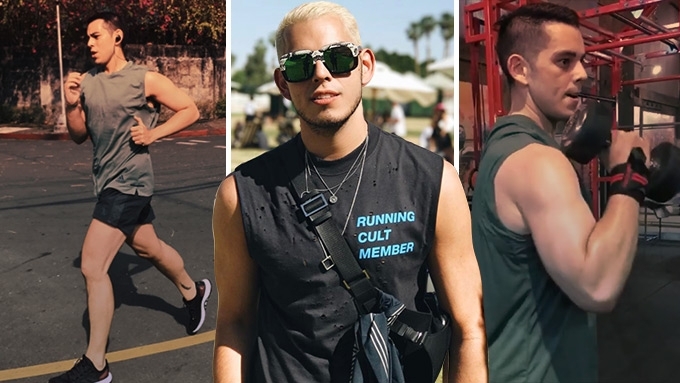 With the help of Anne Curtis, Solenn Heussaff, Georgina Wilson, and their respective partners, he found his way to what he called as 90-day fitness challenge. In fact, the first person he first sought for help was Anne's fiancé and Solenn's brother Erwan. Celebrity fitness trainer Arnold Aninion and nutritionist Nadine Tengco also came around to prop up Raymond's resolve to keep fit. From being a night person, Raymond now is up at seven in the morning to exercise. His routine: one hour of cardio, attend to all his commitments, and another session of weight training in the afternoon. He told PEP, "When we started, it was like three, four times a week. "But when I started enjoying it, I really wanted to do it every day. "Overall, siguro, I dedicate two hours to three hours max per day with working out." In his vlog, he owned to moments when he came close to giving up, "There has been so many moments where I just want to stop and quit in the middle of the workout. "But give it a few minutes, and we're good again. "I've never worked out so hard in my life, but the small changes I see in my body keeps me motivated. "No more excuses to hold me back!" He realized, too, that "nothing comes easy... It's all about time management and making time for it." So, gone now are fast food meals, salty foods, and alcoholic beverages. Last December, Raymond also stopped eating rice, beef, and pork. They've been replaced by fish, salmon, tuna, vegetables, and potato. Gone too are late nights out and drinking, "Na-realize ko na, for me, kung hindi naman ako kailangan umattend, hindi na lang ako aattend. "And I really said na, I'm only gonna drink if it's a special occasion, if there's something to call for a celebration. "Pero 'pag hindi naman, hindi na lang ako iinom." For Raymond, the battle has just begun, "The moment you're satisfied is the moment that you failed," he said. "So, I don't think I'll ever be satisfied. I think it's all about committing to it, and changing your lifestyle. "Right now, I'm very very happy of what I've achieved." Raymond is beyond excited to share this fitness journey in social media. "...In order for me to get motivated, I felt like I had to share this with people and it had to be in a public platform. "In order to motivate myself, I want to motivate others." His call to action: "To the people out there who's asking me what you need to do to lose weight, you know, if I can do it, so can you. "You know what the secret is, but it's all about committing to it and dedicating yourself. "Like what I said, I was the worst case scenario before. "For me, dedicate time, find a work out buddy. "You don't need an expensive gym, you don't need fancy trainers. "It's all about, you know, go out there and run every morning.